Have you ever had to endure the acting and writing of a sixth grade play? That's basically the level of competence displayed in HELLBOY. Of course, we can't blame the sixth graders for this...after all they are really young and just starting out on their paths to theatrical greatness. But we can blame the people that made this ridiculous nonsense. 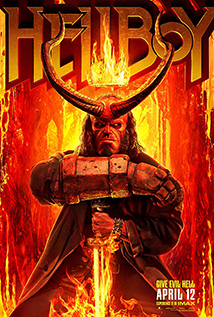 Sitting through HELLBOY is pure hell. 30 minutes into the film I was already completely bored, checking my watch, and wishing time would speed up. 45 minutes in I started to try to figure out how I could turn my water bottle label into a weapon so I could just end it all. One hour in, I gave up entirely and started randomly texting friends. (There wasn't anyone around me, so I wasn't annoying...not that texting during this particular movie could ever be more annoying than the film itself). By the end, I shot out of my seat like an Olympic sprinter. This movie is so bad even Ian McShane is atrocious. And he's great in everything he does. The rest of the cast is even worse than he is, and the dialogue is even worse than the cast. The whole thing is an abomination to the film industry.